Next week I will publish my 300th blog post. It's making me positively philosophical. 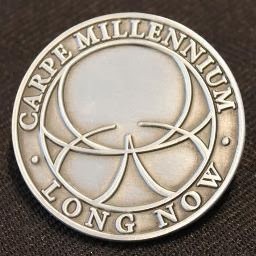 In a time where technology and its attendant sociological consequences are evolving at warp speed, computer scientist William Daniel Hillis created the Long Now Foundation, the purpose of which is to think about our impact over the course of 10,000 years. The concrete representation of the "Long Now" is the clock, (which doesn't exist yet,) but will accurately keep time for 10,000 years. The clock is not exactly meant to be like a Timex, a Rolex, or even an Audemars Piguet. "With continued care and maintenance the Clock of the Long Now could reasonably be expected to display the correct time for 10,000 years. Whether a clock would actually receive continued care and maintenance for such a long time is debatable. Hillis chose the 10,000-year goal to be just within the limits of plausibility. There are technological artifacts, such as fragments of pots and baskets, from 10,000 years in the past, so there is some precedent for human artifacts surviving this long, although very few human artifacts have been continuously tended for more than a few centuries." "The Long Now Foundation has purchased the top of Mount Washington near Ely, Nevada, which is surrounded by Great Basin National Park, for the permanent storage of the full sized clock, once it is constructed. It will be housed in a series of rooms (the slowest mechanisms visible first) in the white limestone cliffs, approximately 10,000 feet up the Snake Range. The site's dryness, remoteness, and lack of economic value should protect the clock from corrosion, vandalism, and development. Hillis chose this area of Nevada in part because it is home to a number of dwarf bristlecone pines, which the Foundation notes are nearly 5,000 years old. The clock will be almost entirely underground, and only accessed by foot traffic from the East once complete."